Teachers receive appropriate training and guidance from school library staff to help students to become proficient in 21st century skills. Teachers and students have access to current, diverse and ability-appropriate materials through the library. About 3 out of 4 (74%) respondents agreed or strongly agreed that teachers and students have access to current, diverse, and ability-appropriate materials through the library. More than half—57%—agreed or strongly agreed that teachers receive appropriate training and guidance from school library staff to help students to become proficient in 21st century skills. 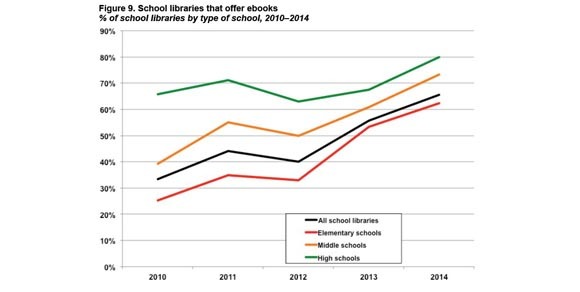 These data help demonstrate the broader role school library services are playing in their schools in Colorado and dovetails with extensive existing research on the impact school libraries have on student achievement. Review the fact sheet about the 2015 results here and check out your local district’s results here, available if the minimum 50% response rate was reached. 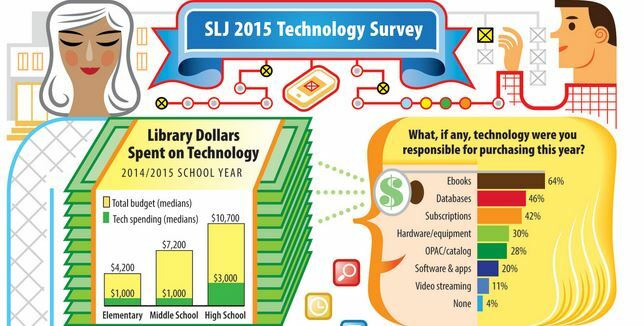 There’s yet more reason to invest in school library programs! Even as the number of endorsed librarians in today’s schools continues its downward trend, studies are consistently finding that there is no substitute for a quality school library program (You can peruse through research done by LRS and other institutions on this subject here). 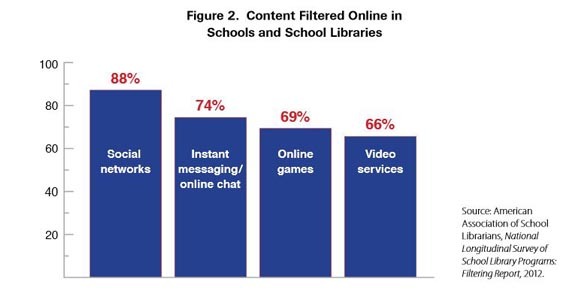 A new study conducted by the Washington Library Media Association (WLMA) and reported by School Library Journal further corroborates these findings. The study, which drew from 1,486 K-12 public schools across Washington state, concludes that students in schools that have a certified teacher-librarian (CTL) are more likely to perform better on standardized tests and to graduate, regardless of whether they live in an urban, suburban, or rural area, and regardless of the income of their household. 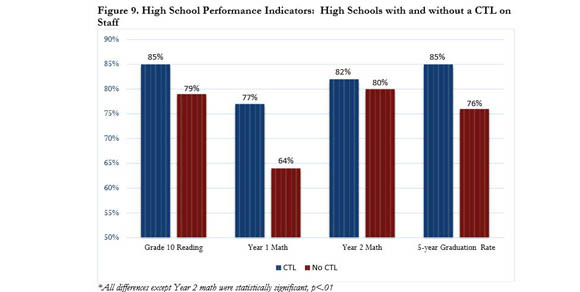 While 85% of students in schools with CTLs graduate in 5 years compared to 79% of students in schools without a CTL, the difference is far more profound in high-poverty schools. In areas where poverty is prevalent, nearly four-fifths (79%) of students in schools that have a CTL graduate in 5 years. This five year graduation rate, however, falls to well under half (43%) of students for schools that do not have a CTL. While these findings are in line with many other recent studies, the WLMA took their research a step further by creating a method for evaluating the overall quality of library services. The Library Quality Scale (LQS) that they use assigns a score from 0-35 to each program based on the number of hours open, visits per week, the inventory of books and databases, and the number of computers available for instruction. 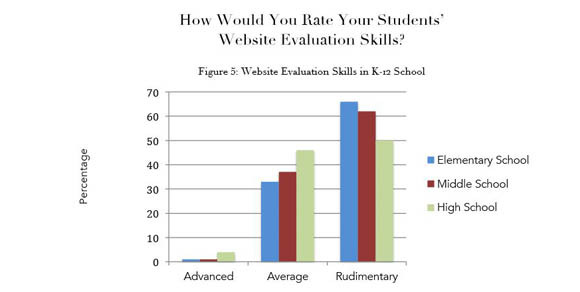 Using this scale, the WLMA discovered that while nearly all of the schools (97%) report having some kind of library facility, minimal resources did not equate to higher performance. Programs that achieved a score over 26, however, had higher student achievement. This suggests that in order to see meaningful impact on student achievement, making an investment in library facilities and staff is critical. Check out the full report from the WLMA here. How many endorsed school librarians and other library staff are in Colorado? 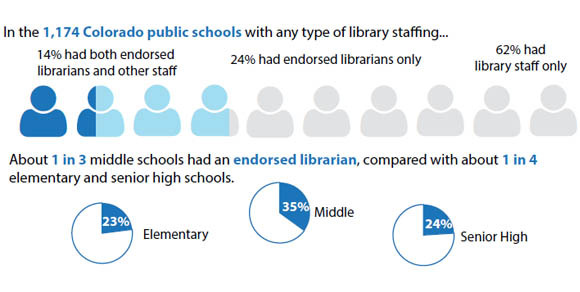 How many Colorado public schools have any type of library staffing? These answers change depending on a variety of factors: position (endorsed librarian or other staff), grade level, school setting (Denver Metro, rural, etc. ), and school size. Based on Colorado Department of Education school staffing data, there were a total of 404 FTE endorsed librarians and 928 FTE library staff in Colorado K-12 public schools in 2013-2014. About 2 in 3 Colorado public schools had some type of library staffing in 2013-2014, but only 1 in 4 had an endorsed librarian. To learn more about school library staffing in Colorado, check our our new Fast Facts. Also be sure to check out our school library impact infographic, which demonstrates the impact of school libraries on student achievement. In a follow up to data collected in 2012, EasyBib completed a survey this year of 1,182 school and academic librarians, and 10,471 students, in order to determine how libraries are evaluating and responding to the need for information literacy instruction in schools and in higher education. The report shows there is a wide gap between K-12 schools and academic institutions in both perception of research ability and instruction offered. Although school libraries are integral to building an early foundation for information literacy, the data indicates that many students are not receiving dedicated or sustained instruction on how to evaluate information across media platforms until they go to college. Though all higher education institutions had at least some information literacy training, 12% of K-12 schools reported having no research instruction whatsoever. If we look just at high school libraries, the number reporting that they have no instruction of research skills jumps up to over a quarter (26%) of that group. It’s easy to recognize that information literacy instruction is likely getting shortchanged at school libraries due to budget and time restraints. However, because all librarians know the importance of information literacy, and know that its value is likely to increase in the future, EasyBib suggests that many school librarians will need to get creative in their approaches to research instruction. Such strategies might include online video tutorials, creating better awareness of subscription databases, and fostering better channels of communication with teachers and administrators. A combination of these and other methods could make a big difference in ensuring the future success of today’s students.